Article 20(2) of Directive 2014/40/EU [TPD] places an obligation on the manufacturers and importers of electronic cigarettes to submit a notification to the competent authorities of the Member States of such products they intend to market. Article 20(2) (b) of the TPD requires the notification to include a list of the emissions which result from the use of the product. The TPD requires emissions from all notified products to be included within the submission. The testing should be carried out in accordance with the expected use of the product and the usage instructions as provided in the product's user leaflet, or by a standardized puff regime once available (reference should then be made to this standard in the submission). 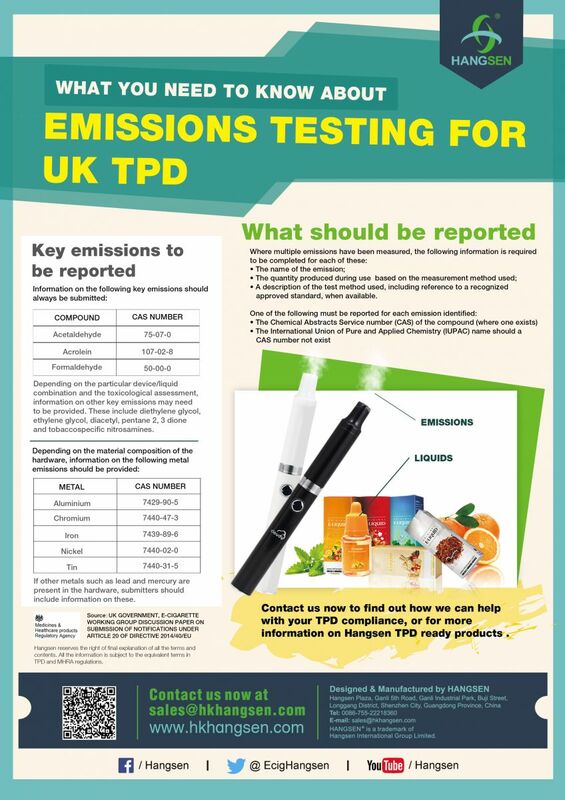 Click the infographic below to check the details of Emission Testing for UK TPD. Contact Hangsen now to find out how we can help with your TPD compliance, or for more information on Hangsen TPD ready products.